During the many hours which were spent putting these history pages together more than just a few questions became unanswered. If you can help to solve them we would love to hear from you. Drop us an email. The Tower Farm Poem. Who was the Author of the Poem? "E. Keele", could be a man or woman. We also don't know the time of writing, what inspired the writing, or the exact time when the poem was written. The Tower Poem was published in a newspaper around 1918. A copy of the old clipping was found in the Guest Register. Also in the register was a news paper clipping in response to the publication of the poem. It was titled "Reminiscences of the Tower". It was written and signed: Mrs. Clinton Atwood , "Ashelworth", Lakefield, Ontario, Nov. 8, 1918. Lots of good text and description. 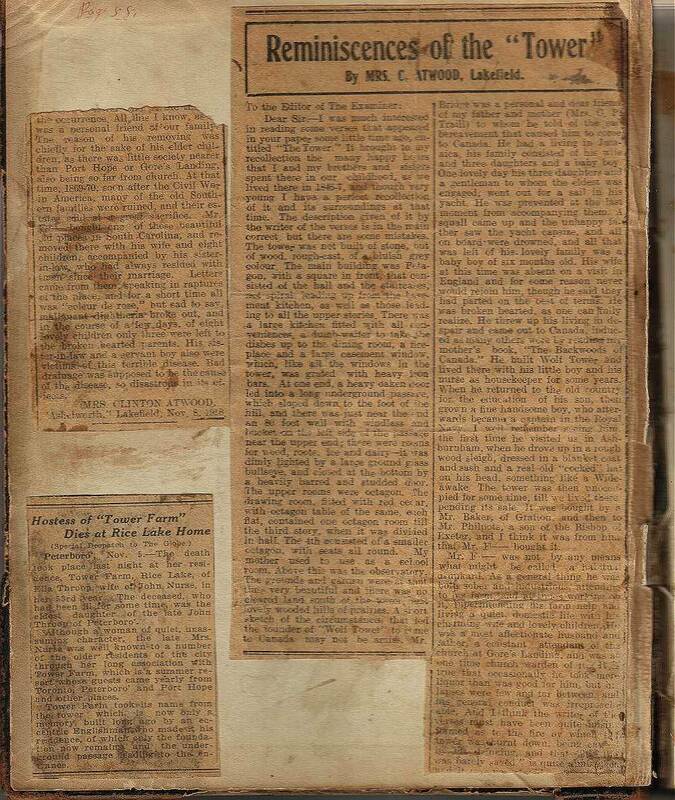 Scanned image of article is a 247K download ( 1.5 minutes) but, makes for some very interesting reading. The " 30 Year Club". Was a group of individuals who traveled to Tower Manor Lodge for a large number of consecutive years. Its has been said that the ring leaders were two brothers - "fairly well healed". Apparently, the Club had an officially registered charter in Ottawa. There was a charity associated with it. A few of the rules: must be 30 years old, 30 members in the club. Signatures in the Guest Registers show the Club visited every year on the 3rd weekend in June, from 1954 to 1963. 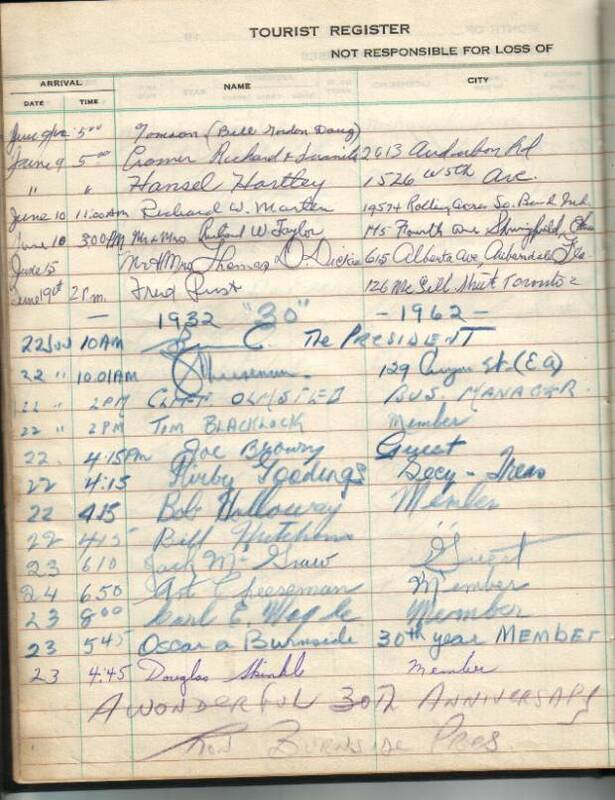 1962 was the 30th anniversary of the club according the the guest book register sign-in. Can you help identify the group, the charity, what happened to the group? The Lost Years. There exists a very large time gap in the oldest of the Guest Book Registers. Aug/06/1928 to Sept,03/1939. We don't know if operations ceased for a few years or if there is a missing Guest Book Register. We wonder if someone can help us out here? The American Plan. 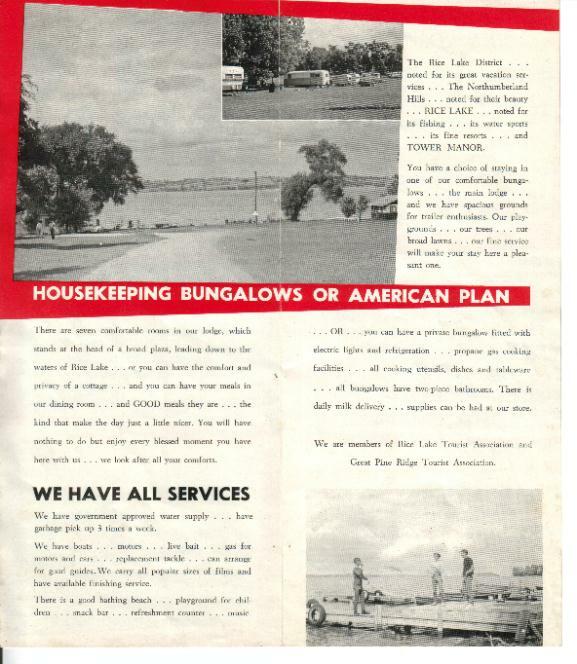 One of the old tourist flyer brochures describes "Housekeeping Bungalows or American Plan". We're not sure just what the "American Plan" was. Maybe you can tell us?